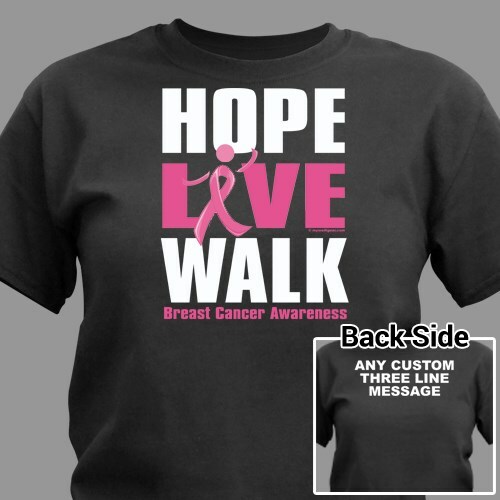 Support your loved one on every Breast Cancer Awareness Walk with your Personalized Breast Cancer Awareness Walk T-Shirt. This particular shirt would be perfect for a group of people walking together as a team. It's time to take action. Your unending support and commitment helps fight against Breast Cancer. Our Breast Cancer Awareness Shirt is a great way to support the fight against Breast Cancer. Cancer T Shirts is available on our 100% cotton shirts, machine washable in youth sizes XS-L and adult sizes S-3XL. FREE Personalization is included on the back of each Shirt. Personalize the back of your Breast Cancer Walk Shirts with any three line custom message. Great shirt, have gotten many compliments when training with my group. MyWalkGear.com has many additional Personalized Breast Cancer Gifts for your special gift giving needs. Each time a gift is purchased from our Breast Cancer Awareness line of personalized gifts, MyWalkGear.com will donate a portion of the proceeds to help in the fight against breast cancer. Be sure to also take a peek at our Personalized Breast Cancer Walk Awareness Water Bottle and Personalized Breast Cancer Walk Awareness Hooded Sweatshirt for any upcoming walk event you may be participating in.